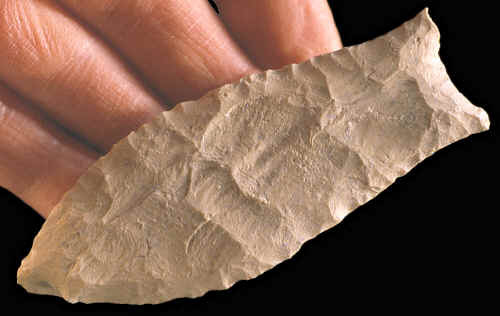 This Simpson point was found during the excavation of the Harney Flats site in Hillsborough County, Florida. The two earliest point types found on this site were Simpson and Suwannee points. The main difference between these two points is that the Simpson point is more wasted, has less prominent ears and is generally smaller that Suwannee points. The Harney Flats site is a deeply stratified site that covered an area of approximately 3 1/3 acres (1.35 ha). This site is one of the largest Paleo-Indian excavations in the southeastern United States. While emphasis was placed on the Suwannee component, a stratified sequence was also present at the site represented by early and middle Archaic occupations. Test pit and block excavations produced 1x1 meter square and level provenience for more than 79,000 pieces of debitage and exact provence for over 1,000 tools within the Suwannee component (Randy Daniel).